Dr. Ronald Allen Bryant obituary. On May 24, 1948, Ronald Allen Bryant was born in Dallas, TX to Eugene Willis Bryant and Dorothy Eakin Bryant. On December 23, 2018, he died peacefully surrounded by his loving family from rare and untreatable prostate cancer. He was proud of his family, and his family was also so very proud of him. He was a kindhearted, positive, curious, enthusiastic, generous, and vibrant man who positively impacted so many lives. 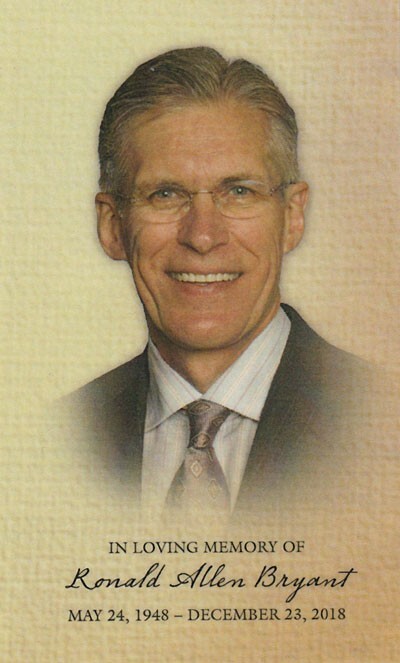 His death is a tremendous loss for his family, his friends, and the field of dentistry. Dr. Bryant truly felt like he was born to be a dentist. As a child, he was always interested in arts and crafts, and could often be found building things in his father’s workshop. In school, his favorite subject was science. In 7th grade, after a visit to his dentist he decided dentistry was a perfect blend of art, craftsmanship, and science. He decided right then to become a dentist and never wavered. As a boy he earned his Eagle Scout which helped establish and cement a legendary work ethic that is the envy of any achiever. He applied this work ethic in pursuit of becoming the very best dentist he could possibly be. Before beginning his dental career, he earned his B.S. from University of Texas, Arlington, and his D.D.S. from Baylor Dental College in Dallas (where he was so grateful for the guidance and mentorship he received from Dr. Jesse T. Bullard). After becoming a dentist, he completed a two-year residency at University of Washington School of Dentistry earning a specialty M.S.D. degree in prosthodontics with emphasis in the field of periodontal prosthodontics. After completing his M.S.D. at U.W., he and his family fell in love with the Seattle area and decided to make it their home. After he began practicing, he was determined to develop into one of the best dentists in his field. He was always thrilled to attend courses providing advanced training in the most cutting-edge dental techniques. He passionately studied cosmetic dentistry, dental implant surgery and restoration, prosthodontics, restorative dentistry, periodontics, advanced soft tissue and bone grafting surgical procedures, TMJ, laser dentistry, sedation dentistry, dental porcelain, and dental laboratory procedures. As a prosthodontist, Dr. Bryant excelled in restorative and reconstructive dentistry. He was regarded by many of his peers as one of the best clinicians in the world. As a tribute to him and all he achieved we are listing his many professional accomplishments below. Dr. Bryant was board-certified by the American Board of Prosthodontics, a process requiring a rigorous test passed only by about 30 percent of trained prosthodontists. He was also board-certified by the American Board of Oral Implantology/Implant Dentistry. Additionally, he was one of only 35 prosthodontists in the world to have earned board certification in both prosthodontics and implant dentistry. Dr. Bryant also attained the distinction of Accredited Fellow of the American Academy of Cosmetic Dentistry, an honor earned by fewer than 50 dentists worldwide. Because of these accomplishments and other notable qualifications, many dentists have referred their patients to Dr. Bryant for difficult and complicated treatments. His additional professional distinctions include being awarded Fellow in the American College of Prosthodontists (FACP), Fellow in the American Academy of Implant Dentistry, and Fellow in the American College of Dentists (FACD). He also had memberships in the American Dental Association, Washington State Society of Prosthodontists, American Academy of Implant Dentistry, Academy of Osseointegration, American Academy of Fixed Prosthodontics, Washington State Dental Association, Seattle-King County Dental Society. Further, he was a former faculty member at both the University of Washington School of Dentistry and Baylor Dental College. He also achieved honors in Omicron Kappa Upsilon Honor Society, Alpha Chi Honor Society, Southwest Academy of Restorative Dentistry Award, Baylor Odontological Honor Society, and the Psi Omega Scholastic Award. While his family and his career were his greatest passions, he also enjoyed photography – especially nature and wildlife photography. Photography was in his genes; his father was a professional portrait photographer, as was his brother. He also enjoyed flying single-engine aircraft and had ratings for land, sea, and IFR. Dr. Bryant is survived by his wife Cheryl McDonough Bryant; sons Jonathan Allen Bryant (wife Austin) and Jason Bryant (wife Marisa); grandchildren Mikayla Leigh Bryant, Audrey Anne Bryant and Maxwell Jameson Bryant; and siblings Ray Howard Bryant (wife Debra) and Robyn Bryant McDowell (husband Fred). He was a man beloved by many who gave so much to his family and to the world. He will be greatly missed and is gone much too soon.